Nakd have added another variety to their range of wholefood snack bars called Nakd Strawberry Crunch. These Fruit, Crunchies & Nut Wholefood bars are ‘Gleefully Made in Britain’. They're described as 'filling & yummy; no added sugar; wheat, dairy & gluten free’ and they contain 18% protein. Since I’ve been looking for healthier foods which are also lower in calories, Nakd bars have become a regular staple in my food cupboard. I tend to stick with the Banana Bread, Coco Loco, Berry Cheeky and Apple Pie bars as they all have around 100 calories each. 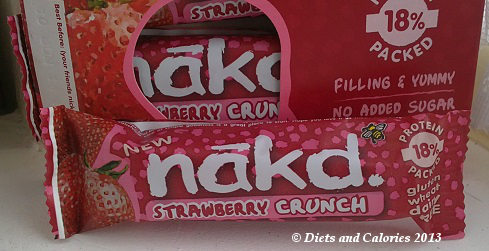 Nakd Strawberry Crunch has a similar number of calories – 109 per 30g bar. They're also available packed four to a box. Like the others in this range they are squidgy and chewy, but the Strawberry bars also provide a crunch - this comes from the soya crunchies. Although they’re called Strawberry Crunch, strawberries account for just 2% of the ingredients – see below. But even though the main ingredient is dates, in common with most Nakd bars, the overall flavour is indeed strawberry. Like all the Nakd bars, this is a snack you can feel good about eating. It's reassuring to see they're made from nothing but natural, healthy ingredients, with no added sugar. However, you will notice they contain a high level of sugars, although these are natural sugars. Nakd bars are suitable for vegetarians, vegans, children, adults and everyone in between! That last suggestion was mine. However, if you’re a nut allergy sufferer you’ll have to forgo these bars. Sorry. Also, if you're trying to lose weight on a low GL diet, these bars probably won't be ideal due to the high levels of sugar which comes from dried fruit. Available in health food shops, larger supermarkets and online. Ingredients: Dates 43%, soya crunchies (soya, tapioca starch, salt) 17%, cashews 17%, Raisins 17%, Strawberries 2%, Apple juice (concentrate) 2%, Hint of natural flavouring. Nutrition Information per 30g bar: 109 calories, 5.5g protein, 14.8g carbs, 13.0g sugars, 2.7g fat, 0.5g saturates, 1.5g fibre, 0.1g sodium. Sugar: High. Fat: Medium, Sat. Fat: Medium, Salt: Low. These are great gluten free bars...very delicious, I've also tried the cocoa and orange bars, very tasty.